Want to know more about the price of 300l geysers?300l solar geyser prices, Please visit our website in depth. According to our knowledge, the appearance and size of the solar geysers are different. The production time is different, the demand is not the same, and the price should not be the same. To find out more about geyser prices, write us an email to get first-hand information on Geyser. 1. Perfect design, very suitable for family use. 2. The use of natural circulation, 100% solar energy and do not need to run cost. 3. 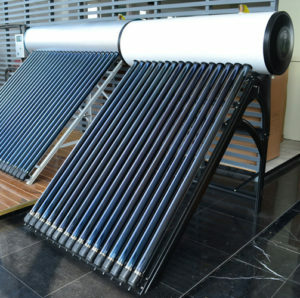 Solar collector adopts a double-layer vacuum glass tube, high thermal efficiency and durable service life. 4. The use of plug-in connection between solar collector and insulation water tank and very easy to install. 5. Parts with low cost, no maintenance and no expensive maintenance costs. 6. The use of food grade stainless steel SUS304 manufacturing barrels, no pollution and no corrosion, to keep water quality clean and sanitary. 7. Using ultra-thick polyurethane insulation, a long time to keep the tank temperature constant. 8. Can be combined with the use of electricity, gas and other alternative energy. 1. Solar vacuum tube was evacuated into the tank, the coating inside of tube can absorb heat energy from sunshine. 2. The cold water in water tank flows into the tube and become hot because of different density between cold and hot, there will be a natural circulation in the tube. Hot water will float back to tank. 3. The polyurethane heat insulation layer can keep the water warm about 3 days without any sunshine. Consumer can enjoy comfortable bathe anytime. What are the advantages of this solar geyser? 300L hot water per day for 6-8 people. 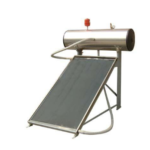 This product is one of the preferred products for low cost solar water heaters in hot areas and is very popular in South Africa, West Africa, solar water heater Mexico and Central America. The solar water tank barrel adopts food grade stainless steel SUSU304 material,300l solar geyser prices, good corrosion resistance, safe, non-toxic and no pollution. To protect the family with water safety and good health. Solar geyser tank with automatic argon arc welding and argon double protection can effectively prevent the surface oxidation. Strict measures that control welding process can better protect SUS304 crystal structure not being destroyed. The service life of the barrel is more than 15 years. Solar geyser tank with polyurethane insulation, good process and 55mm thickness, to ensure that the temperature drop of hot water is less than 2℃ within 12h. And there is a guide about 150l geyser price, 100 litre geyser prices, solar geyser prices, you can check and learn how to fix those problems.